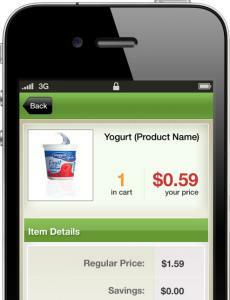 An iPhone app scans items and adds them to an electronic shopping cart. And now, check out at the supermarket over the phone — the iPhone, to be precise. On Monday, Modiv Media Inc. of Quincy will launch a software app to allow customers with Apple Inc.’s iPhone to scan groceries and even check out at three local Stop & Shop stores. “You walk in, you open up the app, you scan anything you want,’’ said John Caron, Modiv Media’s senior vice president of marketing. By aiming the phone’s camera at the bar code on a product package, a user can see the price and add it to an electronic shopping cart. Once shopping is done, the app relays the information to a checkout register, where the customer can pay with cash or a credit card. There’s no need for a store employee to manually scan the items, making checkout much faster. Modiv Media already offers the same service through handheld self-checkout scanners found in 350 supermarkets in the United States, including local Stop & Shop outlets. For now, the new app will work only at Stop & Shop stores in Braintree, Quincy, and Plymouth. Stop & Shop will introduce the service to more stores throughout the year. To use the app, a customer will need an iPhone 3GS or iPhone 4; older iPhone models are not compatible. Later this year, Modiv Media will offer an app for users of phones that run Google Inc.’s Android operating system. The app connects to the store’s Wi-Fi wireless network, allowing the retailer to collect and analyze information about purchases. The store can offer special coupons and discounts to customers, based on each one’s individual buying habits. Modiv Media said that Kraft Foods Inc., Nestle USA, Perdue Farms, and SC Johnson and Son Inc. have signed up to offer coupons through the app. Modiv Media is also planning a feature that will let users add a grocery list; The phone could then remind users to buy vital items during shopping trips. Modiv Media was formed by the 2007 merger of two retail technology companies: MobileLime and Cuesol. In 2003, Cuesol launched its first self-scanning product for supermarkets, a bulky device that resembled a laptop computer. Modiv Media’s current system uses lightweight handheld scanners. Chairman Paul Schaut said that system is still too costly for most stores. “The retailer has to spend a fair amount of money to put it in,’’ he said. So far, only Quincy-based Stop & Shop and Giant Landover, two US chains owned by Dutch supermarket company Royal Ahold have adopted the system. Its high cost has kept the technology from catching on with other companies. “We’ve not yet been able to convince other chains to write that size check,’’ said Schaut. But now, millions of Americans own smartphones capable of scanning bar codes. Equipping those phones with scanner apps would let retailers install self-scanning at relatively low cost. Schaut said that Modiv Media is in talks with a major retailer about using the system, and that he expects his company “will dramatically expand its footprint’’ over the next 18 months.